You all know I love Bodhi products so I am more than happy to share with you their latest campaign. 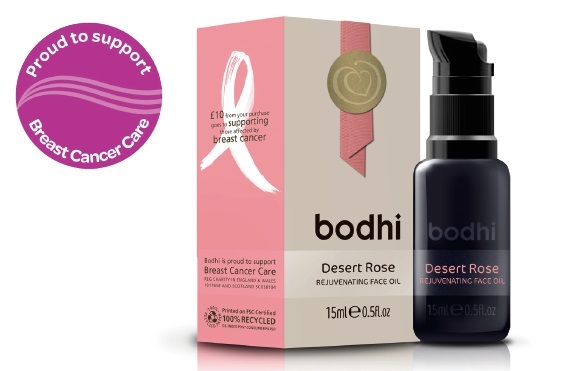 Bodhi has created Desert Rose Rejuvenating Face Oil Limited Pink Edition and will donate £10 from each £38 sale to Breast Cancer Care. Desert Rose Rejuvenating Face Oil is based on the most revered of roses: the Bulgarian Damask Rose. It features Damask Rose Ottofrom the Valley of Roses in Bulgaria, organic Argan oil sourced from Essaouria in Morocco, and Rose Hip oil which is renowned for its anti-ageing and scar-diminishing properties. I sampled and reviewed this face oil when it launched and it is divine. If you would like to show your support for Breast Cancer Awareness during September and October, this exclusive Bodhi face oil is available from www.bodhiandbirch.com and participating stockists.